I'm simplifying things! It's always good to simplify to see things clearer. 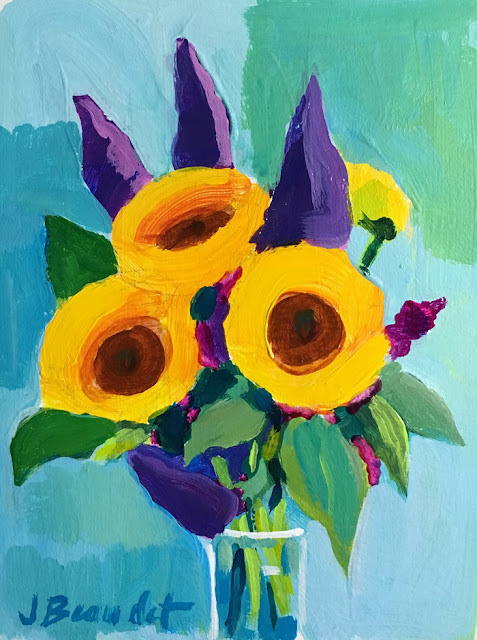 This 30 day painting challenge by Leslie Saeta is a good time for it too! I mentioned before that I had added more detail than I intended to, so I'm going the extreme other way. Cleaning up the clutter! I might do a few of these and maybe try oil. This one is a 5x7 inch acrylic. Not sure if I'm going to sell it as I wasn't even sure if I should share it. It's kind of far from what I've been doing but I want a fresh start to the new year! Now you may have figured out the theme of my challenge so far has been flowers. I was thinking I'd do the first half flowers and the second half landscapes but...I'm having such a fun time with the flower theme I might just end up with 30 florals.